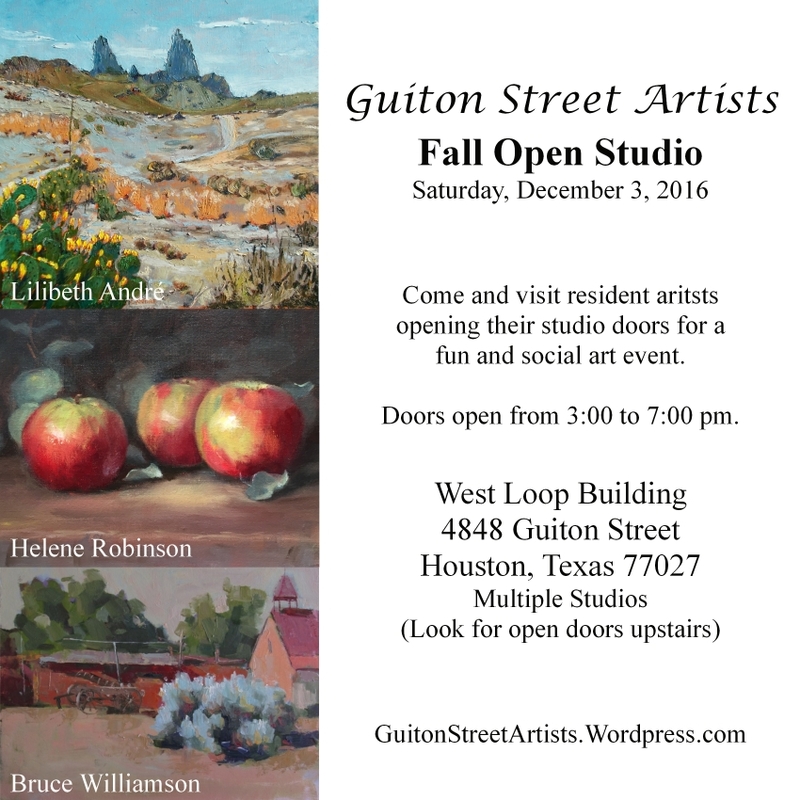 A listing of scheduled activities by Guiton St. Artists. Saturday, November 16. 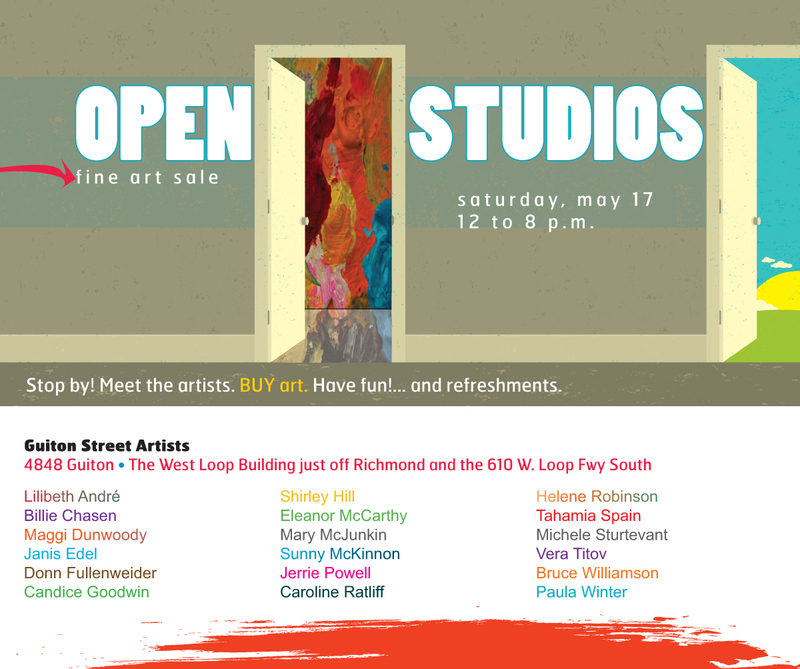 Doors open from Noon to 8 pm. 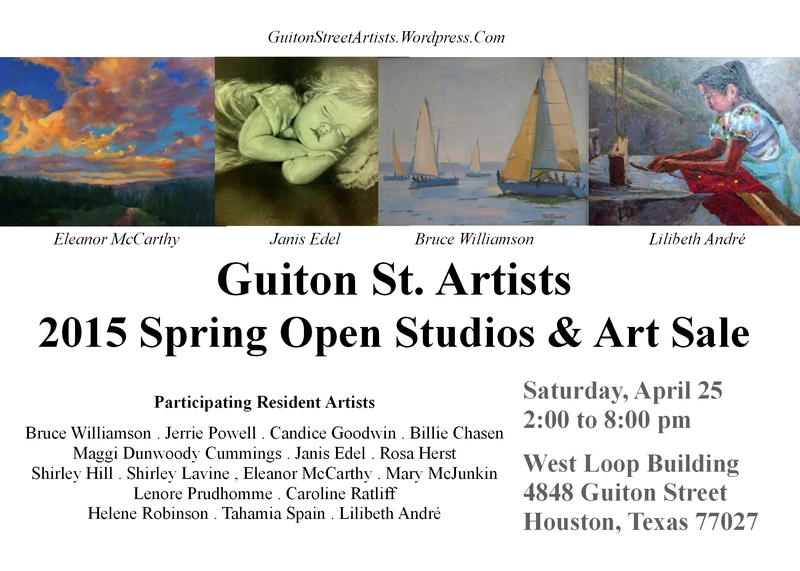 Participating Artists: Bruce Williamson, Jerrie Powell, Candice Goodwin, Linda Bukema, Billie Chasen, John Daniel, Verlinde Doubleday, Maggi Dunwoody, Janis Edel, Rosa Herst, Eleanor McCarthy, Mary McJunkin, Sunny McKinnon, Lenore Prudhomme, Caroline Ratliff, Helene Rob, Tahamia Spain, Paula Winter, and Lilibeth André. Thursday, April 18. Doors open from 6 to 9 pm. Friday, April 19. Doors open from 6 to 9 pm. Saturday, April 20. Doors open from 2 to 8 pm. Live music by Jimmy Dan with Will Golden and special guest–you’ve heard her on The Voice. 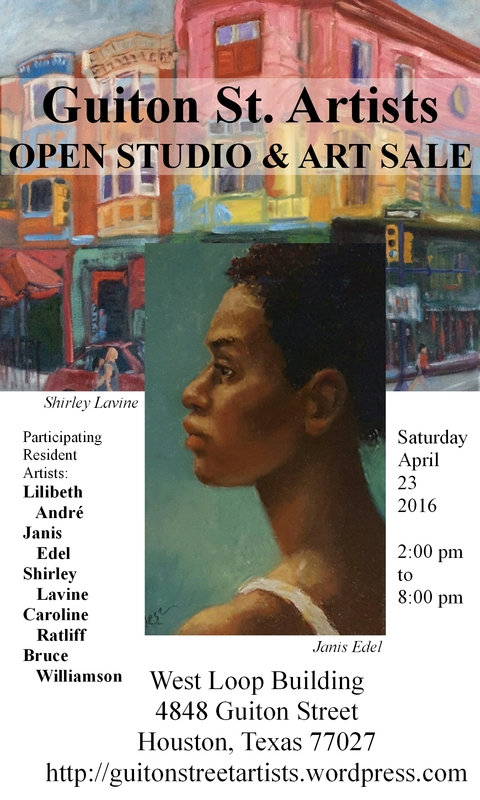 Artists open their studios to exhibit their latest works. 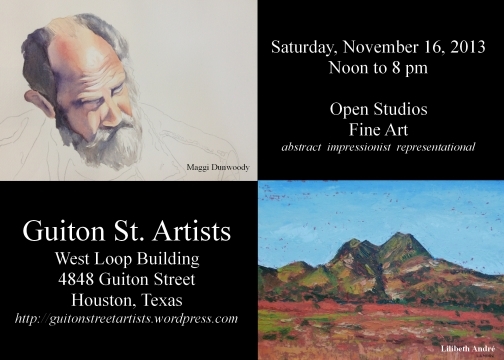 Saturday, November 3, from 2 to 8 pm. 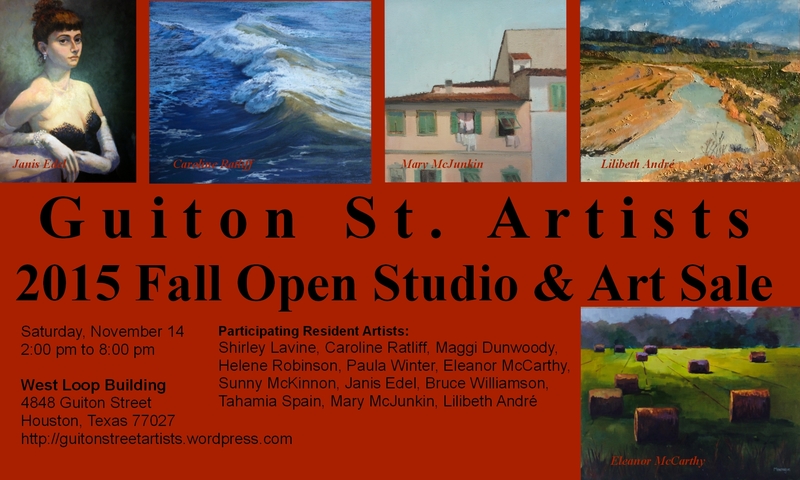 Participating Artists: Lilibeth André, Linda Buikema, Maggi Dunwoody, Candice Goodwin, Margaret Griffith, Eleanor McCarthy, Mary McJunkin, Caroline Ratliff, Helene Robinson, Tahamia Spain, & Bruce Williamson, Paula Winter. Saturday, May 19, 2012. Doors will open at 2:00 pm and will close at 8:00 pm. Saturday, October 29, 2011. Doors will open at 2:00 pm and will close at 8:00 pm. May 21, 2011, 2:00 to 8:00 pm. Thanks Candice. We missed you. 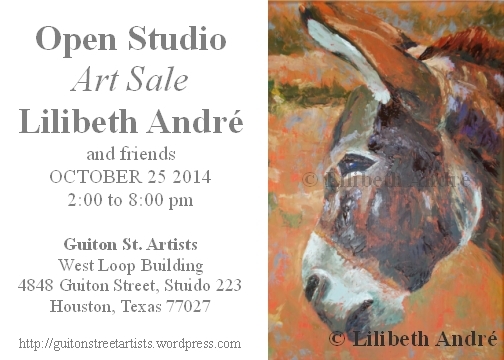 Hope to see you in October for the next Open House!